Pelgrane no afloja el ritmo y ya prepara nuevos escenarios para Trail of Cthulhu. Tras un breve periodo de tranquilidad, Pelgrane vuelve a la carga con nuevos suplementos para El Rastro de Cthulhu. El primero es The Apocalypse Machine, que ya anunciamos en nuestro último repaso de novedades de Pelgrane. 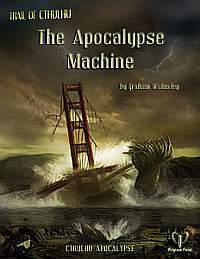 The Apocalypse Machine se puede descargar en formato PDF de 72 páginas por 8.95$ en la web de Pelgrane. Many Fires es otro escenario para ToC ambientado en esta ocasión en el estado mejicano de Chihuahua. Como ya comentamos, se relaciona con Pancho Villa y el general Pershing. Obra de Jason Morningstar, el PDF de 44 páginas se vende por 7$. En el último informe de Pelgrane View from the Pelgrane’s Nest, descubrimos además Coffins, un escenario de Adam Gauntlett para Trail of Cthulhu nuevamente ambientado en la Primera Guerra Mundial (como Not so Quiet). También nos informan de que Hellfire va viento en popa (podéis ver allí una de las ilustraciones que se usarán) y que se ponen a la obra con la saga Mythos Expeditions, suplementos que estarán centrados en expediciones a lugares remotos del planeta. Muuuchas gracias Entwistle, y también al Guardián de los Arcanos doquiera que esté. Por el boletín de Pelgrane comentan que está disponible el prepedido de Out of the Woods, con el gancho de que te mandan el PDF temporal al momento. La verdad que tiene muy buena pinta. Anoche se me pasó esto . Tiene buena pinta, sí. Midnight Sub Rosa. The diary of Ezekiel de la Poer, a colonial-era French necromancer hanged for child-murder in 1736 was stolen at the home of an emeritus professor in the small town of Rosa, Alabama. His house lives in the eaves of a forest of white ash. Can the Investigators find the book before its thief becomes something else entirely? The Silence Mill In a small village in Brittany close on the Arthurian forest of Brocéliande, a friend of the Investigators stands accused of serial murder, cannibalism and even lycanthropy. Can they ascertain the truth, or will the truth find them? 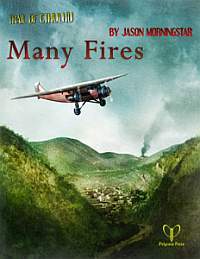 Dreaming of a Better Tomorrow for 30 Dollars a Month Amongst crowded green precipices and muttering forest streams of Vermont, labourers from one of Roosevelt’s integrated Civilian Conservation Corps camps disappear. In an atmosphere fraught with political intrigue and Jim Crow laws, can a mixed bag of Investigators find the primordial peril which threatens more than just one camp, or even one State? The Coldest Walk. Deep in Wisconsin’s northern woods lies the town of Four Pines – a quiet, almost forgettable community. However, whenever the aurora flashes in the sky the inhabitants have a terrible choice to make. Can the Investigators stop the inevitable, or must they take the Walk for themselves? Trembling Giant In 1937, the United States government transferred 300 acres to the newly recognized Koosharem Band of Paiute Indians. But this new land is throttled by distorted trees and stalked by unnatural beasts. Nightmares grip the shaman and warning totems shatter – what is the legacy of this ancient land, and can the tribesfolk fight this ancient evil? ¿Es el tercero o el cuarto de la saga "Out of"? Es que me vienen a la cabeza el Out of Time y el Out of Space pero juraría que había otro que no recuerdo, ¿o es que este Out of Woods lo habían anunciado hace eones? Yo creo que sólo están los dos Out of... que has mencionado. No tenía idea de que existiese un tercero. Yo siempre estoy out of place, no sé si cuenta. Y por decir algo inteligente: sí, Out of Woods lo anunciaron en 2015.